On April 25 & 26, 2009, 52 O St. Studios will host their annual Open Studios event. You can view the working and living spaces of over 20 DC artists at one of the largest and oldest buildings dedicated to the practice of Fine Arts in Washington D.C. Artists range from painters to graphic designers, sculptors to musicians, mixed-media artists to furniture makers. The O Street Studios hosts this Open Studio for a rare peak into their process and creative influences. Meet the artists and discuss their work over refreshments, music and interactive activities. Trevor Young returns to present his second solo exhibition, curated and produced by my good friend Annie Adjchavanich at the Gallery at Flashpoint, with 100 paintings in homage to non-places. The exhibition addresses generic spaces, such as freeways, hotel rooms, airports and supermarkets, which are familiar and safe, but often make us feel like we do not belong. Trevor Young: Non-Places, runs through June 6, 2009 and has an opening reception on Saturday, April 25, 6-8pm. Created in his studio in Silver Spring, MD and during a 45 day painting fellowship in Los Angeles, Young’s new works are a departure from his mail art series, Trevor Young Has Gone Postal, in which he mailed more than 500 number ten sized envelopes to his friend and curator Annie Adjchavanich. These elaborately decorated envelopes were exhibited at the Gallery at Flashpoint in 2004. On the road between here and there are anonymous structures, mere rest stops for most of us, but not for Trevor Young. Where some see purgatory, he sees and paints an oasis, and a portal becomes a destination. Young’s “non-places,” coax us down the highway with their seductive smell of familiarity and french fries. His paintings are composites made of a lifetime of mental snap shots taken on countless trips through the drive-thru. We are simultaneously drawn to their slick veneers and repulsed by their lack of history. Young’s gas stations, retail mega chains, fast food restaurants, and airline terminals capture the conflict we feel about such shrines to modern capitalism. Brightly colored and backlit, they snap us out of highway hypnosis like dazzling beacons on a bland horizon. Young renders their flat, artificial surfaces in luscious oil, rich with the evidence of his hand. In Washington, Tokyo, Buenos Aires, and beyond, non-places all essentially look the same, and that is comforting. 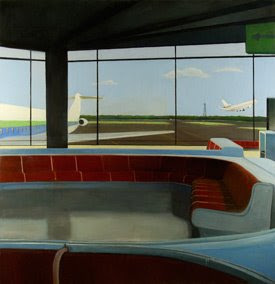 To the artist, airline terminals serve as a gentle transition between the security of home and the shock of flight and then foreign soil. However, non-places have a sinister side. While we may speak their language fluently, Young cautions against blind trust with his haunted, cinematic night scenes. Hotel rooms might feel like homes away from home, but who and how many slept there before? And how clean is that shiny fast food tabletop when we invoke the five-second rule? Like all great love affairs, Trevor Young’s relationship with non-places is a complex one. His use of a traditional medium imbues them with the history they inherently lack, while his prolific practice reminds us that they are a dime a dozen. At once devotional images and mug shots, they marry optimism and cynicism. Lucky for us they make a beautiful couple.